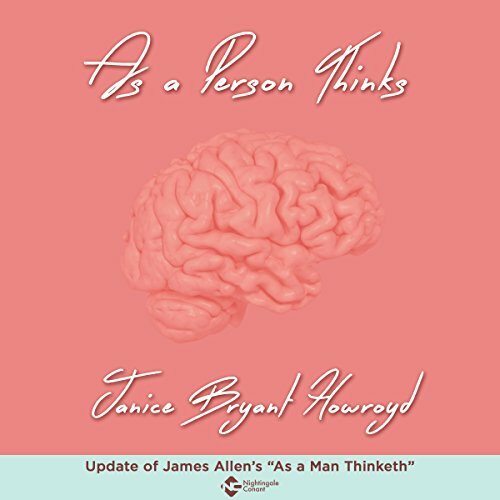 A seminal piece on the power of thought, developed in collaboration with Nightingale-Conant, Janice Bryant Howroyd voices this original classic written by James Allen, a pioneer of the self-help movement. Originally published in 1903, As a Man Thinketh is an essay which argues that the key to mastering your life is harnessing the power of your thoughts and helps you cultivate the philosophy and attitude of a positive, successful person. As a Person Thinks, now enhanced for the 21st century and written as gender-neutral, contains a women's point of view for the first time. Many of these older books focus on saying things such as "when a man" instead of "when a person". Howroyd believes that words matter and can make a difference. "James Allen’s As a Man Thinketh has changed the lives of countless people during the last century, inspiring them to realize the unlimited potential of their own thoughts. Today, Janice is updating this classic to make it more accessible to today’s generation,” said Vic Conant, chairman, Nightingale-Conant. Such a thought provoking audio book. Definitely a must add on Audible as the content is beautifully narrated by Mrs. Howroyd. So much positivity to be gained!